The hour’s drive from Brisbane north to the Sunshine Coast in Queensland is a fairly uneventful drive generally. Pine plantations. Truck stops. Relentless speed enforcement by Queensland Police. But on a Sunday, the drive is absolutely wonderful. It’s not because of the lack of traffic (quite the opposite), it’s because of the kind of traffic that cruises along the Bruce Highway. Classic cars! I’ve seen everything from old Holdens to Mustangs and Chargers, Catherhams, even a Mercury Cougar XR-7 (in midnight blue and chamois!) What makes the drive frustrating is these cars are whizzing past you at 100 km/h and thus impossible to photograph. 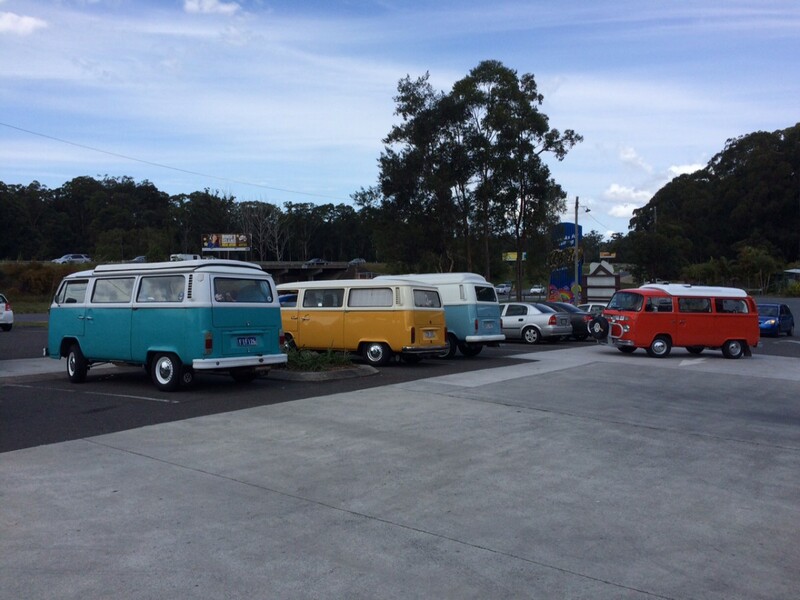 However, I was fortunate enough to see a parked group of VW Busses (or as we call them in Australia, Kombi Vans) when I pulled over to get a delicious meat pie from Beefy’s. It appeared to be a coordinated drive as I’ve never seen four old VW vans in the same spot at the same time. I’m no fan of these vans, but it’s hard not to smile when you see four pristine Kombis in such colorful shades! I’m no fan of them, either, but now that the time has passed when most were in decrepit condition, I, too, must admit that well-preserved ones have a certain charm. I still wouldn’t own one. They drive atrociously, for one thing. The later models drive quite well for a van the old split screen versions, not so good. Although I’ve never owned or driven a VW Bus (Transporter, Bulli, Kombi, Vanagon), I’ve always liked this generation, in production between 1968 and 1979. I used to know someone who had one when I was a boy. From a safety standpoint, Yikes!, I’ve never had any desire to own one. But I’ve driven them (the bay window models) and worked on them, and when I see one now they make me smile. I still think they’re rather handsome at that. I kind of like em but not at the prices they’re going for these days. 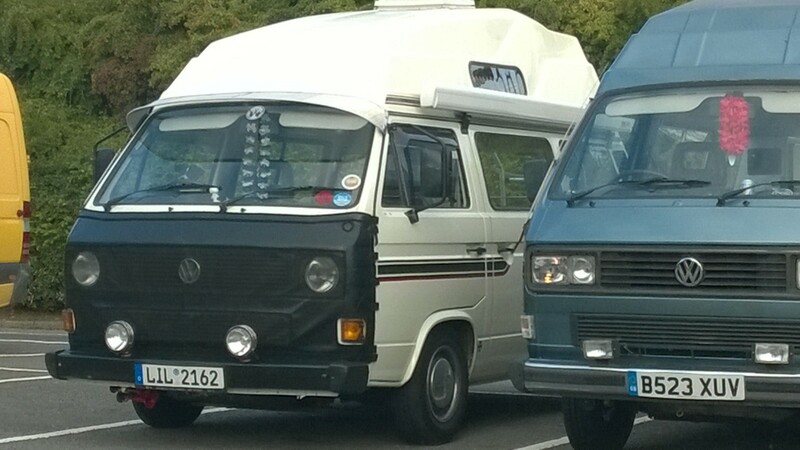 Saw these at a motorway services last week, and actually think they’re much cooler. Probably because they don’t appeal to the wealthy fashionista who drive a lot of the splitties I see. In my country they were never anywhere near as common as the earlier versions. My phobia about being in those was the fact that my front feet could be considered bumper guards. Given that I once rode my friend’s bus from San Diego to the San Francisco Bay Area in 1975. They are fine on flat ground but not so much on the Grapevine. When he got rid of the bus he did replace it with a new Scirocco. Those are all post 1973 models . I have many fond memories of the various & sundry Typ II’s I rattled across America and Centro America in and under . Simple and durable , they’re death traps yes but so are all other vintage vehicles so no fair making a spacial fuss about them . You’re correct Nate, about the death trap-aspect. When going back in time circa 40 to 50 years, almost all Euro-competitors were “forward-control-deathtraps”, even the Mercedes vans (derived from the Hanomag). Exceptions that come to mind are the Bedford vans and the Ford Transit, both from the UK. Hate to shatter the illusion but both Transits and CF Bedfords crumple badly in a crash far worse than VWs that short bonnet out the front doesnt help one bit. Of course. It was merely to point out that the VW bus wasn’t some sort of unique creature / shape. 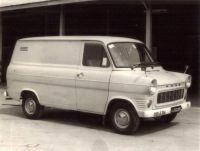 Most vans were built like that, with the engine in the back or somewhere between the front seats. You bring up a good point about the VW Van’s Euro competitors being death traps also. 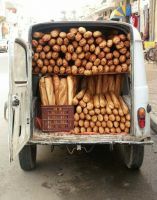 It was the same in the USA with the Big Three’s 1960’s era vans. All of them shared the same lack of protection in the front end as the VW Van. I once saw a VW bus, moose accident in northern Maine. When cars or even pickups hit a moose, it usually knocks their long legs out from under them and puts their body into the windshield with disastrous results for the cars occupants. The shape of the VW bus in this particular accident meant that the roof hit the mooses body at the same time the bumper hit it’s legs, knocking the moose forward. The VW was still a wreck but the people walked away unhurt. In this accident driving one of these death traps actually saved their lives. Good old vans Kombis I dont quite understand the phobia about a collision in one the 68 bay window one I owned had rear ended a VJ Valiant taxi underr its previous owners care, the Valiant was totalled the VW was fine, nobody was hurt, though the LH door was bent out wards and the A pillar bent I jacked the pillar out and slammed the door into a tree until it filled the gap and closed properly another headlight installed and good to go, they are remarkably strong up front not like the US vans you are used to. Travelling in groups especially with Kombis mean when one breaks down someone will know how to fix it and in Australia these things break remarkably often they cant cope with constant highway speeds in hot conditions, nursed along at 80-90 kmh they’ll run for ages as long as you dont have a twinport 1600, the suitcase engines were fairly durable but the poor old uprights dont last at all, especially the twinport the crankcase on these cracks around the crankshaft oil gallery behind the flywheel there is no known effective repair and everything has been tried, Brazillian engine casings fixes it but the casings were $800 last time I priced it. The most reliable vw van that I read about was called the “road cow”. Painted white with black spots like the chick filet cows. Kennedy Engineered Products (KEP) let you back up many different engines to the transaxle and this guy had used one of the little 1700 Toyota hemi fours. Don’t know if he still has a blog or not but I ran across him through the KEP websute, Throwing away the engine might be the best fix for long mileage. YMMV. I would think they’d only be dangerous if the driver is either suicidal or homicidal. Well if the powers publish a couple of my stories, they are about my love for VW Buses. I prefer the split windshield style myself. They are unsafe, death traps and I don’t understand why I love them so much but I do just because I do. That’s the beauty of being passionate about a car. It doesn’t have to make sense. If it did, it wouldn’t be a passion. Go to weebly.com and open a site. Write all you want and people will probably come just through surfing the web. You can do it for free or $50/yr for a few more bells and whistles. Write away. Contact me thru facebook if you have any questions. The truth is that these were meant to be a cheap workhorse to be binned after their economical value was gone. Now these cheap econimical disposable cars have become icons that have helped a shattrered economy back on its feet. Unlike most of the ignorant haters here , I spent decades driving and riding all over America in VW Typ II’s beginning with Pop’s grey market 1954 Kombi ~ a 30 HP crude as it gets box on wheels that chugged along just fine , up some pretty steep mountains and braved the bone chilling winters on New England (you have to experience Maine in January to get this) , hot summers and did fine , 100 % reliable as long as you didn’t mind going the speed limit and hotter’nell in Summer ~ if you didn’t leave off any parts or rip out the headliner etc. , any VW Beetle made after 1951 had O.K. heat as long as there were at least two people in it . As is often said . ‘ haters are gonna hate ‘ ~ they also display serious ignorance doing so . Early VW Typ II’s are _really_ dangerous ~ in the early 1990’s I was tasked with getting a $250 1957 VW Panel Truck (3/4 ton BTW) back running and driving , I did so but told the owner the rust perforation just above the front bumper leading from side to side , meant it’d collapse in a very minor collision so he sold it to his Cousin , a body man who stupidly began driving it as his Shop Truck , in two weeks a stupid lady in a Toyota pickup truck with her two un belted kids in it , turned left directly in front of him , he now has one mangled leg and one prosthetic and will also probably blame the Vintage VW for his self inflicted life of misery . Stupid / ignorant is what it is . BTW : I love that cute little Renault ! . My dad had a 67, the last year of the splity. We lived in eastern Europe for 3 years, Spent our summers touring different parts of Europe, and even up into Scandinavia, along the coast of Norway. 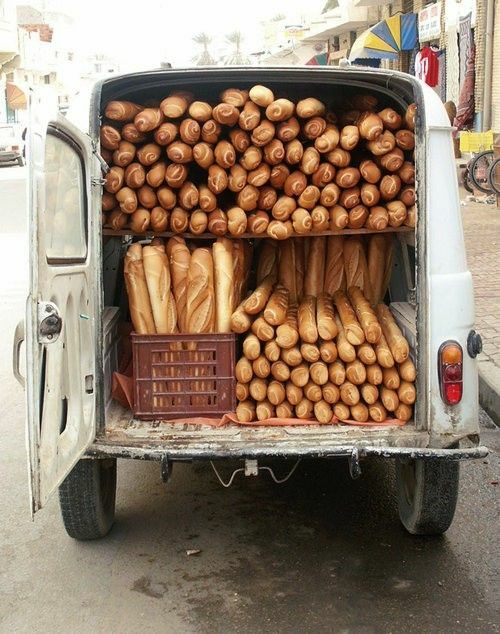 We also spent summers in Italy and Spain, and not one time did the van let us down. As long as you take proper care , and drive them gently, they’ll give you good reliable service. And yes, some years are more reliable than others. As years went on, they built more safety into them. The 73s started with the so called Y frame, which provided extra front bumper supports from the frame. Starting in 1980 they were built with a front hidden safety cage There’s a youtube video of a 80s era VW van crashing head on with a Volvo, also known to be a safer car. The van just ran over the Volvo, which was totaled.The van, not too bad. The hipster types love them, but don’t expect them to know how to fix one LOL. Australian prices for them now are pure insanity, driven up by retro hippies I guess. Anyone put a big block in one? I’d like to see the look on the group of VW owners faces that are at every classic car show if one pulled up painted matt black with a dirty big v8 rumbling away in the back. Don’t know about a big block, but I’ve heard tell of Type IIs with Porsche 356 and/or 911 running gear. Somebody did. Read about it in Hot Rod. Of course it was the van shell on a different chassis with a mid engine. That’s about all I remember except that it was an old guy which makes me like it even better. In the 1970’s it was popular for a short time to stuff a V-8 into a bay window (1968 >) Typ II for a while , some were real sleepers, none handled very well and all were sold off shortly after the conversion . What’s the point in a car that’s no fun to drive ? .